Video length: How long should my online content be? Content Marketing – How long should my online content be? 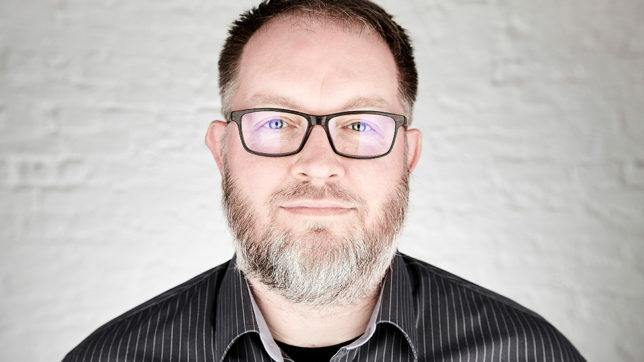 Production Director, Martin Higham, discusses video length and what factors to consider when planning your online content. 1. A video can’t be all things for all audiences. 2. Determining the right video length to keep people engaged is difficult. When done well, online video can be an extremely effective way to build awareness, communicate an idea, demonstrate a product or establish a connection with your audience. When it isn’t, you can lose viewers very quickly – and that’s assuming they click on it at all. So, what is the optimal video length? Really, there’s no easy answer. 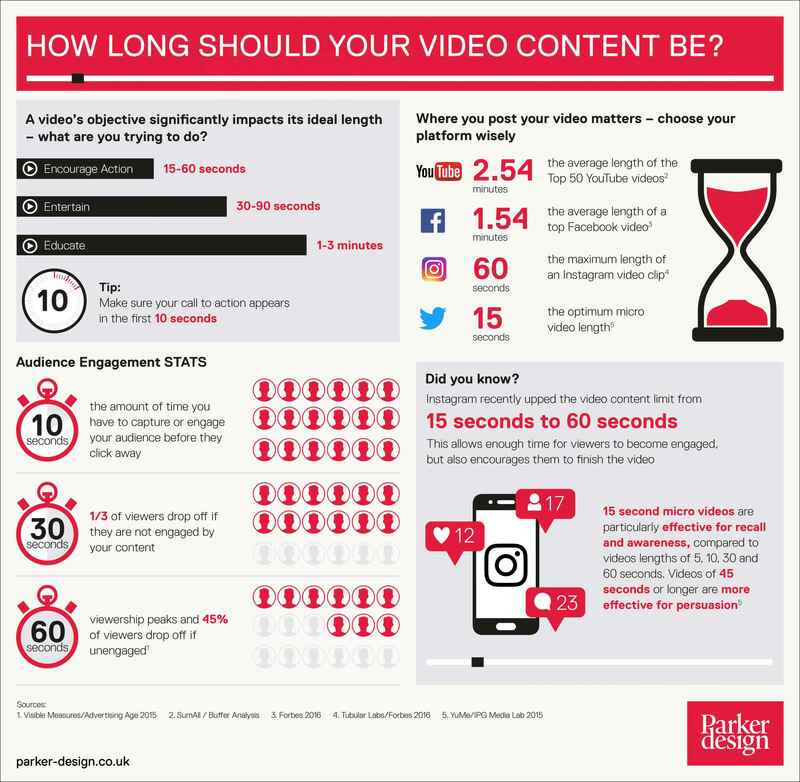 However, we’ve put together this handy infographic and a few guidelines below to help you identify the video length that is right for your project and will keep your audience engaged. So what exactly is your video supposed to do? Are you selling a product? Raising awareness about an issue? Trying to entertain, or celebrate? It matters. The objective significantly impacts your ideal video length, so knowing what you want viewers to do can give you an idea of how long it needs to be. Videos that encourage action: keep it short, clear and persuasive (between 15-60 seconds). Videos that educate: learning something new takes a bit longer, so consider using repetition or signposting and keep it simple; clearly answer the question – why should I care? (1-3 minutes). Videos that entertain: give yourself some time to connect and set the stage, but viewers will drop off quickly if they are confused or bored (30-90 seconds). Viewers today have short attention spans, so reference your call to action within the first 10 seconds, just in case they click away. Where are viewers likely to find your video? Will it be hosted on your website? Or are you creating something specifically for social media? Or is it exclusively for internal awareness and engagement? It’s important to consider this question early in the process, as audience expectations about video length are often primed by where it is seen. What’s effective on Twitter, may not work well on Instagram or YouTube. Not only are viewers used to seeing certain kinds of content on certain platforms, they may also be using a different device to access it. For example, 90% of videos viewed on Twitter are seen on a mobile device – this may be a problem if your video is hard to see, hard to hear or is 10 minutes long. 2.54 minutes: the average length of the Top 50 YouTube videos. 60 seconds: the maximum length of an Instagram video clip. 15 seconds: the optimum micro video length on Twitter. 1.54 minutes: the average length of a Top Facebook video. While I’ve tried to provide some useful tips to help you decide how long your video should be, there are no hard and fast rules. The needs and preferences of your audience will ultimately be the deciding factor. A longer video that’s well produced and focuses on a topic that your viewers are passionate about can be just as successful as a shorter one, but engagement is the key. Longer videos require more planning to maximise engagement, as you’re asking viewers to invest more time in your content. Viewers decide whether your content is relevant or not within the first 10 seconds, so elements such as title, description and initial visuals matter. Up to 1/3 of your viewers will drop off if not engaged within the first 30 seconds. Viewership peaks at the 60 second mark for most videos, but if your content isn’t engaging nearly half will drop off at this point. Clicking play isn’t enough – if your viewers aren’t watching at least 75% of the video, you’ve missed the mark. Remember, there’s an incredible amount of competition for your audience’s attention – whether internal or external. The length of your video isn’t nearly as important as whether or not the content is relevant, but it can affect engagement. I know from experience that great video content is part art, and part science. With viewers regularly exposed to great content, focusing on what your audience wants and expects will deliver better results than trying to make a video that works everywhere, for everyone. So, keep it as short as you can, but ultimately, focusing on giving your audience what they really want will be what makes it engaging.